Global climate wrecked by volcanoes caused the largest mass extinction ever | Watts Up With That? A new study could help explain the driving force behind the largest mass extinction in the history of earth, known as the End-Permian Extinction. The event, also known as the Great Dying, occurred around 250 million years ago when a massive volcanic eruption in what is today the Russian province of Siberia sent nearly 90 percent of all life right into extinction. Geologists call this eruption the Siberian Flood Basalts, and it ran for almost a million years. “The scale of this extinction was so incredible that scientists have often wondered what made the Siberian Flood Basalts so much more deadly than other similar eruptions,” said Michael Broadley, a postdoctoral researcher at the Centre for Petrographic and Geochemical Research in Vandœuvre-lès-Nancy, France, and lead author of the paper. The work, which was published in Nature Geoscience, was co-authored by Lawrence (Larry) Taylor, the former director of the Planetary Geosciences Institute at the University of Tennessee, Knoxville. Taylor, whose prolific career at UT spanned 46 years, passed away in September 2017 at age 79. Through the analysis of samples, Broadley and his team tried to determine the composition of the lithosphere. They found that before the Siberian Flood Basalts took place, the Siberian lithosphere was heavily loaded with chlorine, bromine, and iodine, all chemical elements from the halogen group. However, these elements seem to have disappeared after the volcanic eruption. “We concluded that the large reservoir of halogens that was stored in the Siberian lithosphere was sent into the earth’s atmosphere during the volcanic explosion, effectively destroying the ozone layer at the time and contributing to the mass extinction,” Broadley said. Magmatic volatile release to the atmosphere can lead to climatic changes and substantial environmental degradation including the production of acid rain, ocean acidification and ozone depletion, potentially resulting in the collapse of the biosphere. 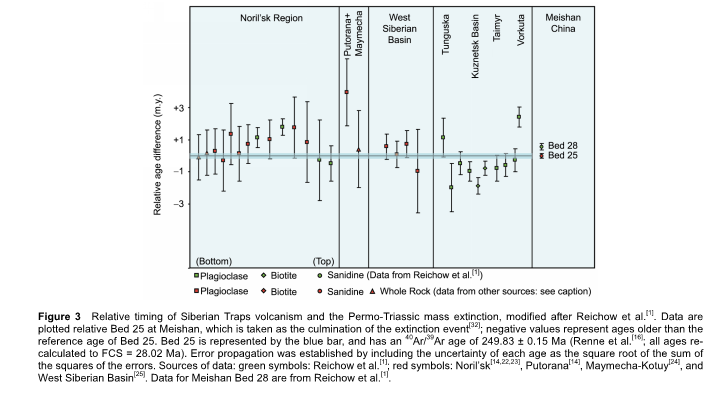 The largest recorded mass extinction in Earth’s history occurred at the end of the Permian, coinciding with the emplacement of the Siberian large igneous province, suggesting that large-scale magmatism is a key driver of global environmental change. However, the source and nature of volatiles in the Siberian large igneous province remain contentious. Here we present halogen compositions of sub-continental lithospheric mantle xenoliths emplaced before and after the eruption of the Siberian flood basalts. We show that the Siberian lithosphere is massively enriched in halogens from the infiltration of subducted seawater-derived volatiles and that a considerable amount (up to 70%) of lithospheric halogens are assimilated into the plume and released to the atmosphere during emplacement. Plume–lithosphere interaction is therefore a key process controlling the volatile content of large igneous provinces and thus the extent of environmental crises, leading to mass extinctions during their emplacement. August 28, 2018 in Extinction. They mentioned “climatic changes” without “CO2” in the same sentence. They’re doomed. Btw, this reads like a proper science… I feel dizzy, I must lay down for a minute. Ah, but Timo, this is scientific proof positive that we must ban the element chlorine and all manmade chemicals that (don’t) destroy the ozone layer. So probably they’re fine. It seems to dovetail with the recent nonsense about how the most important thing we can do for Climate Change TM now is to replace “dangerous” chemicals in air conditioners. Because you know, a few leaking air conditioner units is about the same as a massive eruption event that lasted almost a million years. Actually there was a fair old amout of CO2 involved with the Great Dying as well. The Siberian Traps erupted through fairly extensive coal measures, and in doing so managed to output truly vast amounts of CO2 into the atmosphere over a very short (in geological time) period. The effect was to make the oceans so CO2-enriched that they were slightly fizzy. Needless to say this had fairly catastrophic effects on oceanic life; a mere 95% of all land life died, whereas in the seas about 99% died out, including all the Trilobites. It seems that they had no land-living forms to carry on the line, and their ocean-living forms all used oceanic planktonic larvae for dispersal. That meant curtains for the lot of them when the oceans turned toxic. When I was a kid, I use to admire the plastic trilobites in the ocean dioramas at the Smithsonian Natural History museum. Now, I wonder if they would have been good eating, and there might have been “Trilobite Days” at Red Lobster. An odd thing about trilobites is that their shells (including eyes) were made of the mineral calcite, like clam (mollusk) or crab (crustacean) shells, rather than chitin, a long chain polymer derived from the sugar glucose, as in other arthropods. Most trilobite orders had gone extinct long before the Permian, which finished off the few survivors. That implies that the partial pressure of CO2 in the oceans was greater than the partial pressure of CO2 in the atmosphere. If the oceans became enriched with CO2 from being in contact with the atmosphere, can you explain how the oceans had more CO2 than the air? Interesting article, especially as a catastrophic environmental/climate event was associated with the formation of the Siberian Flood Basalts. The worlds flood basalts appear to be associated with a crustal/lithospheric plate over-riding a HotSpot. It makes sense that melting a source provenance enriched in halogens (probably plus water) would produce more eruptive volcanism as crystal fractionation leads to volatile enrichment and eruptive pressure. Look at the basalts erupting now at Hawaii, they fountain up from a vent due to underlying pressure, not due to density or heat contrast. These flood basalts can also include large felsic magma segregates that produce explosive pyroclastic type eruptions, such as Yellowstone, and double down on the destructive effect. Us gold-digging geologists tend to focus in on these felsic segregates, and yes, there is placer gold at Yellowstone below the Lower Falls. Boy Ron , geology sounds hard. I’m glad I went with electricity instead. The Russian Federation doesn’t have provinces. The paper reference was to a geologic province, not a political subdivision. Municipalities and such are not political sub divisions, they are administrative. Maybe you speak Russian and know better, but I think that область (oblast’) translates properly to region whereas провинция (provintsiya) or губерния (gubyerniya) would be the term referring to a province. But in Czarist Russia, they would have been губернаторских (gubyernatorskikh) or Governorates. In any case, the lead-in seems to have misinterpreted the paper’s reference to a geologic province. Some Soviet countries have provinces, districts and independent cities. In Kyrgyzstan these are called Oblasts, Rayons and Shaars respectively. The two Shaars are Bishkek and Osh. At the local level there are groups of villages, for example 3, which have a local municipal elected chief. It is very likely this same arrangement exists throughout that portion of Asia, with different names for the divisions, a hangover from the USSR. Peter D. Ward pointed out that the Siberia, Siberian Traps Large Igneous Province releases large volume of gases (CO2, CH4, and H2S) Oxygen (O2) levels dropped from 30% to 12% Carbon dioxide (CO2) level was about 2000 ppm. Yadong Sun, Temperatures reach 50-60°C on land, and 40°C at the sea-surface. Happened 251 mya. this was about 8 million years after the Karoo Ice Age ended that had started 350 mya and it was around a million years before the suspected Wilkes Meteor Crater occurred in Antarctica, also hypothesized to causing Earth’s worst mass extinction eliminated 90% of ocean dwellers, and 70% of land plants and animals.. Going from a 90 million year long Glacial Period to an Interglacial Period that was hotter than at any other time – with almost no ozone layer as pointed out by this article – the Earth had hardly recovered flora and fauna from one event to the next, in less than a million years from extreme cold to extreme hot and poisoned atmosphere. Making this period one of the few mass extinction events during an Interglacial Period, where others were during Glacial Periods. It about stands to reason that the flora and fauna that survived were the more massive of species that came later. “DUH”, iffen proxy graphs are to be believed, then 85+% of all life on earth had surely already gone extinct prior to the above noted volcanic eruption that supposedly occurred around 250 million years ago, …….. which means that nearly 90% of the surviving 15% of earth’s life forms perished. Please note that the Average Global Temperatures (<10 degrees C) persisted between 320 mya and 260 mya ……… and the average atmospheric CO2 (<200 ppm) persisted from 340 mya to about 255 mya. That’s 60 million years of “chilly” temperatures along with 85 million years of “malnutrition” causing atmospheric CO2 quantities taking their toll of earth’s plant and animal populations long before any erupting Russian volcano decided to join in the Great Dying. Interesting, there is a big drop in temperature about every 150 million years. Nir Shaviv, one of the founders of cosmoclimatology, attributes this to the solar system’s bobbing up and down in its trip around the galaxy. I pointed that out in other WUWT articles awhile back and I described that graph in my comment. Because for some reason I couldn’t post it here on WUWT. I pointed out that Glacial Periods are Anomalies and Interglacial Periods are the Normal Earth Temperatures. And that 17 degrees Celsius is the Mean only because of those shorter Glacial Period Anomalies. That by that graph and others that are available on the internet, that if 17 degrees Celsius is the Mean, then we are still in a Glacial Period and it has never ended as scientists have been saying it did. When to qualify as an Interglacial Period the Global Temperature has to rise above that 17 degrees Celsius Mean. In geology, “interglacial” doesn’t mean what you apparently think it does. The current “ice age”, ie the interval of time in which ice sheets have periodically formed in the Northern Hemisphere, began about 2.58 million years ago. The last such “ice age”, with continental ice sheets, began some 360 million years ago, during the Carboniferous Period, and lasted into the Permian. The Cenozic “ice age” began about 34 million years ago, in the Oligocene Epoch, when the East Antarctic Ice Sheet formed. As noted, ice sheets didn’t exist in the Northern Hemisphere until much more recently, ie at the outset of the Pleistocene Epoch, 2.58 Ma. During an ice age such as the Pleistocene, there are glacial advances and retreats, in which ice sheets melt or shrink. When the North American and Eurasian Ice Sheets melt, we enjoy an interglacial, such as now. It’s called the Holocene Epoch, but is really just another garden-variety interglacial, of which there were dozens during the Pleistocene. As noted, they last from thousands to tens of thousands of years. The glacial intervals last from tens of thousands to over 100,000 years. But even during the “ice ages”, when ice sheets cover the continents, there are advances and retreats of ice. These are called stadials and interstadials. So it’s incorrect to call the intervals of millions of years between Icehouse Worlds, in which such continental ice sheets might form (but don’t always), “interglacials”. That term has a specific meaning in geology. Thanks Sgt. I stand corrected on terminology. It has been my understanding from the 1970s that Interglacial Periods meant the periods of higher temperatures between Glacial Periods, as presented by my teacher in Earth Sciences from middle school, on into high school science classes. There was no mention of Hothouse and Icehouse that I can remember ever hearing about. And when studying for writing essays I don’t remember ever seeing those terms. I grew up on National Geographic Magazines from way before I was born, that my father saved and subscribed to until the middle 1980s. I can find nothing about it in them either. There is only 1 article they have mentioned Interglacial and their definition is; “time between ice ages, when global temperatures are warmer and sea levels rise.” a direct quote from their online web page. The oldest mention I can find of an Icehouse and Greenhouse terminology is 1998 which means that the terminology did change for an Interglacial as in the afore given definition. 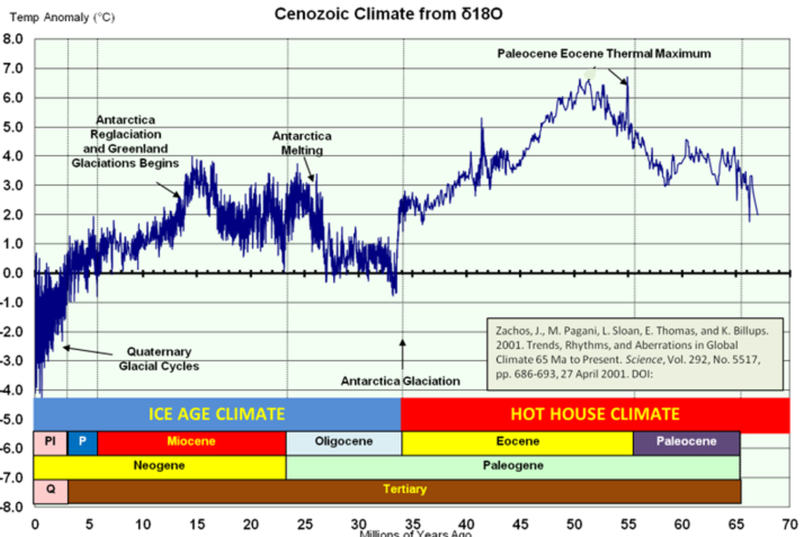 Going by the definition of Hothouse between Icehouse events as given in the above graph, the Earth has had much longer stretches of Hothouse conditions, than it has had of Icehouse conditions that are shorter lasting cold periods, caused by Anomalies that are below the Global Normal Mean Temperatures of the Hothouse Temperatures. There is a 17 degrees Celsius Mean between the Hothouse Mean and Icehouse Mean temperatures. That we are living in an Interglacial Period of warming within a Icehouse Glacial Period that is 2 degrees Celsius below the Global Historic Mean, will at some point return to the Global Mean of a Hothouse that is our Earth’s normal temperatures, that starts when our global temperature goes above that 17 degrees Celsius Mean. While we are arguing about semantics of fluctuations of about 1.0 degrees Celsius being Global Warming or Global Cooling and over the warming effects of Carbon Dioxide or it’s lack thereof. The long term Hothouse condition or the Icehouse condition is unpredictable during this Interglacial, that can be triggered by forces out of our control like meteors, comets and massive volcanic activities or the reduction in those Anomalies that are contributing aerosols from multiple volcanic activities globally and the extended period of less Solar Activity we are seeing… that can at any time flare up causing another Hothouse condition. There is – in my opinion – a consensus with skeptics that increasing CO2 is the result of warming and not the alarmist ideology that increasing CO2 causes warming. When as that graph above shows CO2 at 2 – 3 times more during the longest Hothouse condition from 270 mya to some 37 million years ago (with a short anomaly of cooling) and yet the global temperature was far above it with no correlation, other than some fluctuation of cooler and warmer climates and a great fall in CO2 when the last Icehouse condition started mass extinctions and water/ice sequestration of it. That has only partially recovered as the Interglacial started warming the Earth and all living Biomass has since exponentially increased from the increasing CO2 in the environment. The terminology can be confusing because the term “ice age” can mean different things. During the Phanerozoic Eon, ie the past 541 million years, there have been just three “ice ages”, but four “icehouses”. The Mesozoic Era was warmer than usual, so its cold interval or “icehouse”, didn’t produce continental ice sheets. The arrangement of continents also probably played a part. The “ice ages”, ie intervals with continental ice sheets, were of different durations, probably dependent upon tectonics. The Ordovician was short, the Carboniferous long and the Cenozoic in between, so far, but with no end in sight. Within each of these “ice ages”, there are longer lasting glacial or ice sheet advances and shorter retreats, ie interglacials, as at present. The only surviving Northern Hemisphere ice sheet now is on Greenland. But during the glacial phases, North America, Europe and Asia support vast ice sheets, comparable to Antarctica’s, which has waxed and waned for 34 million years. johchi7 – did you also note the direct correlation between the increase in atmospheric CO2 as denoted on the above graph from 270 mya to some 37 million years ago coincides directly with the “rise & fall” of the Age of the Dinosaurs? Large increase in atmospheric CO2 ppm “triggered” large increases in plant growth. Increases in plant growth “triggered” increases in size and numbers of herbivore dinosaurs. Increases in herbivore dinosaurs “triggered” increases in size and numbers of carnivore dinosaurs. Then when the atmospheric CO2 ppm started “decreasing” the above process reversed itself. And thus the Age of the Dinosaurs officially terminated with only their descendant birds surviving. You don’t mean Interglacial, but Hothouse as opposed to Icehouse. Interglacials are warmer intervals during a glacial epoch, period or periods. Also, mass extinctions occur in both Icehouse and Hothouse conditions. The Ordovician/Silurian MEE was glacial. The Late Devonian occurred during the transition from one state to the other. The Permian/Triassic was during a Hothouse fairly shortly after the Carboniferous-Permian Icehouse. The Triassic/Jurassic and Cretaceous/Paleogene MEEs were during Hothouses. Taking the graph above Sam C. Cogar provides. We know that this graph has a rounded temperature history. Which periods last the longest and which the shortest? Scientists point out repeatedly that Anomalies of massive volcanic activity, meteors or comets or combinations cause Glacial Periods. This trying to re-label Glacial and Interglacial Periods that decades of scientists have established is not helping. I’m not relabeling anything. I’m saying what glacial and interglacial means, in the strictest geologic terms. As noted, an interglacial is an interval, such as now, between ice sheet advances. The last from thousands to tens of thousands of years during glacial epochs or periods. During the glacial intervals, there are stadials and interstadials. The term Icehouse is used to distinguish long periods of tens or millions of years in which colder conditions persist, ie in which ice ages may occur. Ice sheets however don’t always form during them, as was the case in the Mesozoic Era. Yep. We’ve generally had an ice house or ice age climate since the beginning of the Oligocene. There may have been a brief hot house climate during the Middle Miocene Climatic Optimum. Ice age climates are characterized by year-round ice in one or both polar region with episodic glacial and interglacial stages. The most similar previous period to the Plio-Pleistocene ice age was Pennsylvanian (Upper Carboniferous). So it was *only* water that was subducted? No chance that any sea-bed went down there also? Mud. Dirt. Slime. Grot. Stink. Shale. Seabed containing epic amounts of water-soluble plant-nutrients. Nutrients that are constantly being mobilised by plant life on ‘dry-land’ and gently but irreversibly washed into the ocean. From where they NEVER return. Only water comes back from the ocean but it needs the epic grunt of Old El Sol to move it. Everything else sinks. Until a volcano strikes up and brings the seabed back into circulation. OK. Some critters got burnt in the eruption but, that eruption could be argued to be the (re) birth of Life on Earth as we presently know it. We are here now because of it. Odd coincidence that the coal I’m presently sitting above in Notts, Yorks and Derbys is ‘about’ that many millions of years old. How was that stuff made – why were plants growing so strongly that decomposition simply couldn’t keep up? The farmland dirt round here is still quite good – very good in Lincolnshire but a lot of Lincs is reclaimed seabed. There goes them pesky nutrients again. Lincs was also *vast* amounts of peat, now mostly gone. Maybe up into the sky? As carbonoxide – not at all dissimilar to what comes off volcanoes while they’re actively spewing? Damn those nutrients eh Damn that dirt for having them. Damn that ocean for stealing them all. Damn that soil erosion. Damn them world-wrecking volcanoes. and where are those nutrients now – not nearly all fallen back into the sea perchance? 250 million years is a loooooong time. How’s the nutrient content of your wheat, rice, oranges, apples and pears coming along? Is everyone keeping in Rude Good Health through sufficient nutrient supply? No diabetes? No auto-immune problems or asthma. No cancer. No dementia. No chronic depression. No drug dependency. No thyroid problems. No burgeoning health industry? No lying cheating scumbag politicians or, heavens below, smouldering Sputniks? Many land areas are known to be sections of sea bottom that were scraped off of the subducting crust. Whole island arcs and archipelagos have accumulated onto land surfaces by this process as well. In fact, most of the Western US consists of such accretions, although much is also from igneous intrusions and extrusions. Only small fragments remain of what was once an entire tectonic plate which was subsumed beneath the westward moving North American plate. Recent imaging studies have allowed this subducted plate, the Falloran Plate, to be visualized. It stretches from the Caribbean and upper Midwestern US to clear off the West Coast. Stratospheric ozone comes from UV radiation disassociating O2 molecules. As to the rest of your post, as soon as Google comes out with a nonsense to English translater, I’ll respond to it. You flog this crap in EVERY comment you make. Stop worrying about what other people do to themselves. Did you learn that from listening to “Bill Nye, the science guy”? Getta clue, ….. neither fungus, yeast or bacteria is capable of decomposing very much dead biomass without access to O2, H2O and warm temperatures. Most all coal/peat deposits were formed by dead biomass collecting on the bottom of swamps, shallow lakes and/or inland seas. Plants were never “growing so strongly that decomposition… couldn’t keep up.” The creatures such as bacteria and fungus that decompose plants were then not able to process lignin, a substance plants evolved that makes them more rigid and sturdy, enabling them to grow to greater size than previous fauna. The person who posted below about never again creating coal and oil deposits was correct. Unless plants again evolve a substance that prevents their decomposition. By the way, your comment reveals a decidedly unscientific lack of thinking, evidence of which is your grouping of unrelated events, conditions and processes, then connecting them (without relevant scientific evidence) to various causes. This is similar to the ways pre-scientific Observers link two unrelated causes and effects. For example, when a horde of mice emerged from a pile of rags kicked by a passerby, some believed that the rags had been transmuted into mice! A classic case of creating in one’s own mind a false cause-and-effect relationship simply because the events and conditions–rags were disturbed and mice scampered out–happened concurrently. Does it not occur to you Mr McShann, that your linking of anthropogenic CO2 to AGW, against a background temperature rise since the Little Ice Age, might also be correlation of unrelated cause and effect? And it seems to me that the correlation itself is very dubious, with multi-decade stretches in that multi-century period exhibiting poor correlation, with no reasonable explanation for the deviation: ‘the (modeled) missing heat has gone into the sea’. The reason there is so much coal in Carboniferous layer has nothing to do with decomposition. It is due to the Glaciation that was going on then. Each glaciation uncovered shallow sea-bottoms where swamp forests grew, then during the next interglacial the forest deposits were covered by marine sediments. Repeated durng each glacial cycles. Oil on the other hand has nothing whatsoever to do with this. It is only created in marine deposits. Usually organics-rich slates deposited during episodes of anoxic deep seas. Coal does indeed come from land plants. Oil, not so much. Its biological feed stock is mainly marine microbes. Yup, my neighbor has a piece of “petrified” tree trunk (12″D x 14″l) that that he extracted from being embedded in a seam of coal. I often wonder what life on earth would be like if there were never any mass extinctions. Imagine how many lobsters there would be in the oceans if humans didn’t eat them. I’m doing my part to save the lobsters, I don’t eat them. I’m perfectly willing to admit that I’m happy that I can make it to the subway every day without being attacked by a sabretooth (although I’m ok with them wandering the hinterlands, and maybe one in a zoon). Going on now in Africa, in Ethiopia. Erta Ale finally filled up her caldera and is now engaged in basaltic flooding. Won’t be long before it becomes a fountain. The crust is thin in the Danakil Depression – very thin. Three plate boundaries meet there and are slowly pulling apart. Rifting is a slow, prolonged process, but there is no way to stop it. I’m sure taxing someone would stop it. Let’s get Leo on it. Ha! Yes, plop his little behind right on the edge of Erta Ale’s caldera as a protest against rifting! I like that! The shales at the end of the Permian exhibit components attributed to the fractionation of the melt. 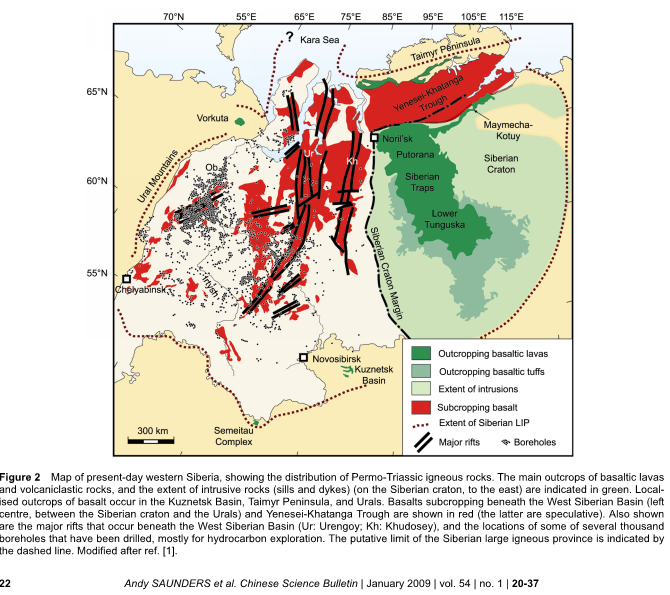 The Siberian flood basalts are the basic end member of the the entire event. Acid volcanism was rife at the same time in the form of exhalative volcanics. The geochemical finger print of the exhalative volcanics is remarkably similar to tephra from Mt Pinatubo and Mt St Helens famous today. It is the same with the Ordovician sequences in the Ballarat Bendigo Trough, Australia. which witnessed the decline of the graptolites. There are many similar events during the geological records. The mid Proterzoic in South Arfica has similar elements. It is a fascinating subject. Bolide impact also appeared to have happened at that time. Likelier than the alleged impact site in Antarctica. Interesting that the article links the impact to the mass extinction, but doesn’t address the possibility of the impact causing the Siberian flood eruption. This article provides evidence (not conclusive proof, contrary to what the article’s title asserts) that the mass extinction event covered in the paper happened in that way. Such evidence does *not* exclude the possibility that similar events could happen in different ways, such as by CO2 and other greenhouse gases overwhelming the atmosphere and heating the planet. Obviously conditions were very different then and the causes of the mass dying we’re different than what’s happening now. That’s obvious, except perhaps to those who love to jump to unscientific conclusions. Conclusions regarding AGW drawn from this, reflected in many of the comments below, and possibly even the unwritten inference implied by the author (it’s clear, since it appears on an unscientific opinion-based, “skeptic” website), are unscientific. Therefore, such conclusions are imaginary. They have no validity except in your own minds. This may well be the world’s most visited websites on climate change or global warming. That doesn’t lend it any scientific validity. Thanks for joining the discussion, however, it’s not clear which comments you’re referring to. I see a lot of discussion specifically about the head posting, but didn’t note any that attempted to make any conclusion regarding AGW. Furthermore, your ignorance regarding the topics regularly posted here is forgivable, I guess, given that you’re a new commenter. You should understand, though, that Anthony (and his other authors) regularly post items of interest that have little, if nothing, to do with the theory of anthropogenic induced climate change. These are merely offered as items of interest to the readership. And if there’s no included commentary regarding climate change, then it’s not about climate change. Your inference, valid though it seemed to you, was inaccurate and ill-informed. Finally, we invite you to peruse many of the topics here, as well as the posted discussions following. I believe you’ll find them to be full of robust scientific debate/discussion. Not all commenters claim to have scientific backgrounds, but there are enough amateur scientists, engineers, lawyers, accountants, statisticians, (and even the rare Scotsman) to provide analytical commentary (or, in the case of the aforementioned Scotsman, “colorful” commentary) to the posted claims. It’s a wild and wonderful world we live in, populated with incredibly smart individuals who have both the will and the training to examine many of the claims of modern climate science. I continually learn more every day…and trust that you will as well. Both volcanic activity and/or impact reduces sun’s energy reaching the surface, hence cooling the planet. Cold destroys life. Warming enhances it. Mr. McShann: Greg Strebel’s comment above should have made you think before posting again, evidently not. Your comment appears to be one of the few to state “conclusions regarding AGW drawn from this”. I don’t know what “article’s title asserts” you are talking about, but several phrases in the brief abstract clearly indicate that “conclusive proof” is not asserted at all. If you intend to attack the site as “unscientific opinion”, may I suggest you not couple your attacks with unscientific opinions that you project? I’m unsure of many things, but I value this article and the following comments for the insights they provide. Also, there are some people for whom rational discussion is futile. Their own world view limits them. Pierre: I agree, a good spot. How could you know what comments below were going to say? What is scientifically invalid is assuming that CO2 and other GHG’s are “overwhelming the atmosphere” (whatever that means) and heating the planet, without any evidence supporting that baseless assertion. There is no mass dying happening now. There was a minor extinction event at the end of the Pleistocene and beginning of the Holocene Epochs, but it’s over. It was never even close to a mass extinction event, in which a majority of species on sea and land go extinct, with whole classes of organisms vanishing. The green blob will not care about volcanic eruptions unless they can somehow blame people for them. Well, doesn’t the Greenbeans have to find some way to stop them? That would certainly prevent more of those noxious gases being released into the atmosphere, causing Gorebull warming, wouldn’t it? The end-Permian extinction was largely marine, implying the oceans were poisoned. Could massive volcanic release of halogens do that without similar poisoning of the atmosphere and land life, which were not as relatively affected as the K-T event? Also, water absorbs UV strongly, so the absence of the ozone layer would not have much impact on marine life. When one states, ….. “the absence of the ozone layer” it can only mean one (1) of two things. The elimination of 70% of terrestrial vertebrates suggests that the end Permian event was not restricted to marine environments. The extinction is far too nuanced to allow simplistic explanation. Why would the extinction begin in the ocean? Why were sea levels so low? Unfortunately the article is paywalled, without even accessible figures. By interesting coincidence, that artist’s depiction of ancient Siberian vulcanism matches carbongeddonist’s idea of where Earth is headed unless we immediately Make People Poor Again (MPPA). As with all mass extinctions the problem is explaining not what died and how but what did not die and why. Heat and low oxygen explain why “pig lizard” Lystrosaurus became the dominant vertebrate of the Early Triassic. Its ancestors were burrowing synapsids, ie mammal relatives. I did a bit more research on the Siberian traps, and it always amazes me to see the best guesses as to what the world looked like then – only the huge continent of Pangea, wrapped around the Tethys Ocean. Amazing to imagine. 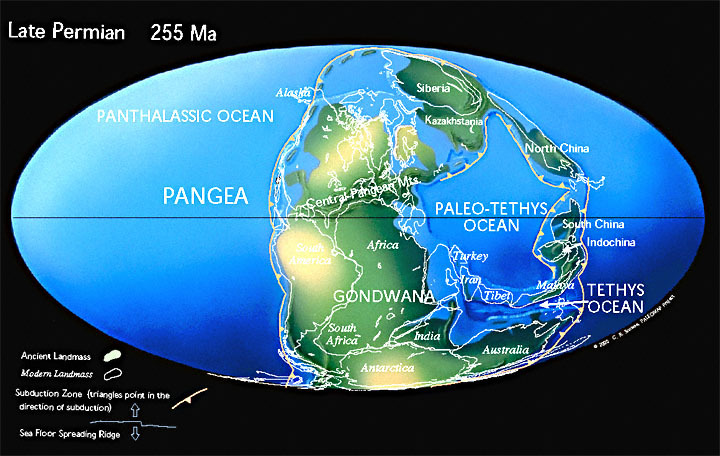 At the Permian-Triassic boundary, it’s not clear that Pangaea had fully formed yet. Siberia and Central Asia might not yet have joined, but at most were separated by a narrow seaway. North China and SE Asia were still islands as well. In line with this article is another near extinction event brought on by a volcano. Werner Herzog’s 2016 Into Inferno documentary (now on Netflix) relates in part to an Indonesian volcano Mount Toba that erupted around 75,000 years ago . The eruptions was so severe that it is theorized that there were as few as 700 human types left in a small part of Africa due to the volcanic winter and temperature drop around the world. If we were to have another eruption of this type in our time line it would be game over for the human race. So much for man made climate change as a real threat to man’s existence on this planet. Volcanoes have caused more damage and destruction over history to the Earth than any other disaster. That theory is pretty much exploded by now. There essentially no real evidence for any extreme population bottleneck at the time, and minimal evidence for any severe climate effects. Why not just ban volcanoes? We could start at the local level, with Mt. St Helens and Rainier. Too bad Red Adair isn’t around to cap them all. More researchers hunting preferred p results, through minimal material and information. Again, researchers develop the most amazing tales of doom destruction and “potential” causes. In the “Supplemental Information“, these researchers analyze fifteen samples of a grand total of 663 milligrams of material to reach their conclusions regarding a million year plus eruption and an extinction event that may be a result. Fifteen samples, 663 milligrams of material, some scatter plots with a linear “best fit” line supposedly connecting them topped off with some odd conclusions; using words like “potential”, “suggesting”, “could”, “may”, “can”, “coinciding”, “remain contentious”, “massively”, etc. etc. We suggest that a single population of fluid inclusions with variable degrees of SCLM-Plume mixing is more likely than having multiple populations of fluid inclusions released to different degrees during analysis. They “suggest” and then confirm their suggestion, by repeat testing one of their fifteen samples; A 30 mg sample. We show that the Siberian lithosphere is massively enriched in halogens from the infiltration of subducted seawater-derived volatiles and that a considerable amount (up to 70%) of lithospheric halogens are assimilated into the plume and released to the atmosphere during emplacement. Mix copious amounts of seawater into million year long eruptions is a definitive extinction event… Or so they claim. Grant-seeking work, of course, but also to directly or indirectly virtue-signal a “conclusion” that it was CO2 that done it. Or halogens causing destruction of the ozone-layer (virtue-signalling to the Freon ban). Or acid-rain (signalling to sulfur control). Or whatever. Yet another explanation for the Permian extinction. The trigger for volcanic fistulas was extraterrestrial impact..